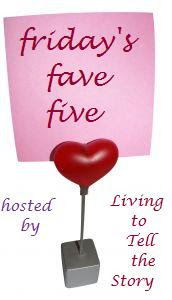 Susanne at Living to Tell the Story hosts this carnival every Friday for people to list their five favorite things for the week. My five things are random. #4 - That 60 degree weather I mentioned? It was just delightful. Sunny and cool. #5 - Plans that fall into place in a way that blows your mind and gets you all excited about the future. We have a number of those this year and we're just holding out with hope! I have never been to a Trader Joe's -- I don't think we have one nearby -- but it sounds like a good thing. Glad your cheesecake turned out well! Looks good! We had two days of 60 degree weather, then it was back down to the 30s, 20s at night. I am so ready for winter to be over, but I was watching the news this morning of the north getting even more snow. I really feel for those folks...and I am really glad I don't live there! Glad to hear about #5! Hey, congrats on the TJ's in your town! So many fun foods to try and basic staples at great prices (like eggs and butter). And congrats on the yard work. It feels good even if all your work isn't visible. You know what you got accomplished. Your cheesecake looks good! I've only baked them a few times, because my mother-in-law makes a fabulous cheesecake. I'd like to try the pumpkin-cinnamon, though! A Trader Joe's store opened not far from here, but every time we drive by, the parking lot is jammed. Someday we'll get there! Trader Joe's is one of my very favorite stores. Great healthy food, reasonably priced. You can't beat their price of banana's and cold cereal. 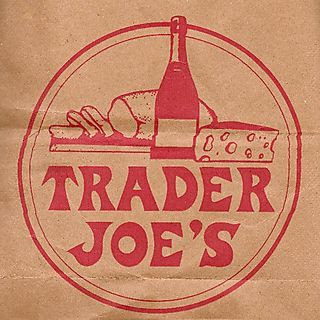 I would *love* to visit a Trader Joe's sometime since I hear about it so much! We do have Whole Foods here though so I really can't complain. Oh, I'm jealous over the Trader Joe's! We don't have one even remotely close to us. I've been, though, and I'd LOVE to be able to shop there regularly. Homemade cheesecake=lots of work=totally worth it! PTL for things that fall into place! I'm impressed by homemade cheesecake. And pumpkin with a cinnamon crust sounds simply yummy! His plans are always better than ours, aren't they? I share that sentiment! Congrats on the nearby Trader Joe's. One opened near me about a year and a half ago and I haven't been the same -- in a good way. Enjoy! Hallelujah!! Thank you so much for that Youtube vid it has officially rocked my world this evening!!! I've heard so many great things about Trader Joe's. We don't have them in Canada that I am aware of . It's beautiful here today too. Not spring time nice yet but we'll get there. There will probably be a last blast of winter yet. mmmm....cheescake! And my sister is going to be thrilled when she hears that about Trader Joes! Not that they live that close, but it's better than driving up to WA to go! Yum on the cheesecake!! Double-yum. Last year, they opened a sort of fancy grocery store in our town (the 3rd grocery store in our fairly small town), and my friend and I are still bummed it wasn't a Trader Joe's! Now that I live on base I have yard people! It was raining in San Francisco! But it was perfect. There's a Trader Joe's across the road from my favorite (and much cheaper) grocery store. I just can't bring myself to go in there. There sure are a few things SO worth the price at Trader Joe's. Such a quirky, fun store, isn't it?!? 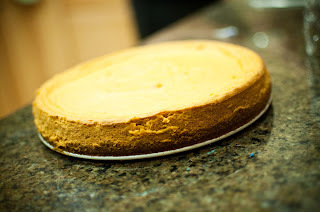 A real, life, homemade from scratch cheesecake? You GO, girl!